With 165 full-colour illustrations and photographs of devices at an advanced stage, the book provides inspiring case studies of today’s most promising marine energy devices and developments, including full-scale grid-connected prototypes tested in sea conditions. It also covers the European Marine Energy Centre (EMEC) in Orkney, Scotland, where many of the devices are assessed. 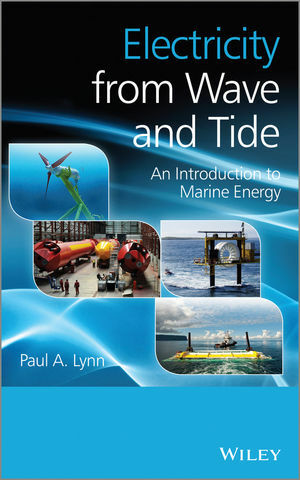 This book is aimed at a wide readership including professionals, policy makers and employees in the energy sector needing an introduction to marine energy. Its descriptive style and technical level will also appeal to students of renewable energy, and the growing number of people who wish to understand how marine devices can contribute to carbon-free electricity generation in the 21st century. PAUL A. LYNN obtained his B.Sc. (Eng) and Ph.D. degrees from Imperial College London, UK. After several years in the electrical/electronics industry, he lectured at Imperial College and the University of Bristol. As a retired academic, Dr. Lynn's long-term interest in renewable energy has led to a trilogy of Wiley books (including this one), and three solar-powered boats. He is the author of ten other books and numerous technical papers and articles.